The colonization of Algeria in the nineteenth century was premised on the belief that Europeans, as well as non-indigenous animals and plants, could acclimatize to life in North Africa. While traditional French science showed little interest in such practical matters as attempting to adapt exotic plants and animals to new environments, support came from the Societe zoologique d’acclimatation – the “French Sierra Club” – whose story is the subject of this book. Because its work was politically useful in support of France’s colonial ambitions in Algeria and elsewhere, the Society found favor with Napoleon III’s government, and its influence was soon widespread. For example, the Society fostered the creation of nature preserves in Africa and zoos in Paris, and its ideas changed the research agendas of pure science as well. 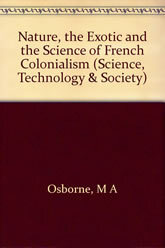 In this major study of how the acquisition of empire affected French science, Michael A. Osborne treats in turn the founding of the Society and its evolution to 1920; its monument to Napoleon III’s “modern” Paris, the Jardin zoologique d’acclimatation; the Society’s core scientific ideology of Lamarckian transformation; the history of provincial acclimatization societies in Nancy and Grenoble; and the Society’s activities in the colonies of the new French empire. An important study of the patronage and politics of science, this book offers new insights for students of environmentalism, science history and policy, and modern European history.